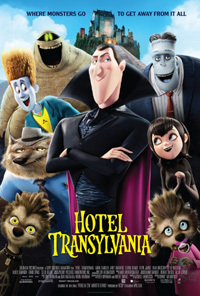 On the one hand there are people who still flip out at horror movies and its “degradation of society”, and on the other it is becoming more accessible with movies like Frankenweenie, Paranorman, and this one, Hotel Transylvania (voiced by the likes of Adam Sandler and some of his old pals like Steve Buscemi, David Spade, Jon Lovitz and Kevin James, as well as teeny-bopper Selena Gomez). Count Dracula lost his wife to a human mob. So, with his baby (Mavis) he moves to a secluded castle built to keep humans out, but act as a retreat for monsters of all kinds. So, on his daughter's 118th birthday a huge party is being planned, with guests including a huge crowd, from Frankenstein's monster and the invisible man, to the mummy, the werewolf (with his big family), gremlins, blobs, zombies, an array of freaks and hilarious creatures plus loads more. Naturally they are all just like regular people, only, they're monsters and ghouls. The Count makes a point of fanning the fear flames of humans' evil ways (which actually hold a lot of merit), but in true late-teen fashion Mavis wants to leave home and explore the world, something the over-protective Dracula cannot allow. However, a young (human) backpacker accidentally stumbles upon the castle, throwing a spanner in the works, as he and Mavis (naturally) fall for each other. With a lot of family values and tolerance issues injected amid the laughs, gags and (atrocious) music (choices), this animated family flick is hardly a horror movie, but fun nonetheless. Extra features include a commentary track, deleted scenes, highlighting two of the (terrible) songs, and Goodnight Mr. Foot (a wacky bonus Ren & Stimpy flavoured Big Foot animated short set in Hotel Transylvania).